Bike commuting and even recreational bike riding has increased in popularity so much in recent years that it is not uncommon for people to be out on the roads on the coldest and windiest days in Greater Boston. While some will look at these dedicated riders who are trying to get to work or training for their next triathlon as somewhat overly-ambitious, to these riders, it is worth hitting the streets anyway. The problem is there are many Boston bike crashes that occur in the winter due to the negligence of people driving in the snow in a manner that is not safe given the current conditions. This is negligent conduct and can be the basis for filing a Boston bike crash lawsuit. Whenever anyone gets behind the wheel of a car in Boston or anywhere else in Massachusetts, they owe a duty of due care towards anyone who might be foreseeably injured by not driving with the requisite amount of care. This is known as the reasonable and prudent person standard and can be found in the proposed jury instructions for the Commonwealth of Massachusetts, which is designed to explain the negligence standard to jurors in civil cases throughout the state. While there are various higher standards of care in cases that involves experts, there is no difference between a reasonable and prudent winter driver and a reasonable and prudent summer driver. This is because, as our Boston bike crash lawyers can explain, a person must act reasonably within the confines of the current conditions, which in this case, means weather and road conditions. It may be safe to travel at the speed limit on a sunny day in July, but on a day in February, with icy roads and poor visibility, driving the speed limit means you are driving way too fast. If this results in a collision with a bike rider in Boston, it would be negligence, and the motorist could not likely use the excuse that he or she was driving within the speed limit at the time of the accident as a defense. This is because, while breaking a traffic law can be used as evidence of negligence, not breaking a traffic law doesn’t mean there is no evidence of negligence. There are a lot of things drivers can do to prevent a serious or even fatal Boston bike accident in bad winter weather, such as driving at a speed appropriate for the current conditions and making sure to use lights even in the daytime. There are also a lot of things bike riders can do in these conditions to help stay safe. This is not to say that a bike rider is required to do all of things to be successful in a Boston bike accident lawsuit, but it is certainly better to avoid a serious bike crash whenever possible. A recent news article from KULR 8 NBC offers some helpful suggestions for keeping safe when out on a bike in the winter. 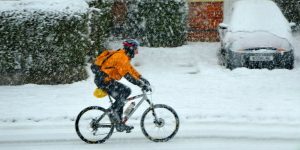 These winter bike safety tips were offered following another article in which a bike rider was seriously injured in a collision involving a motor vehicle in bad winter weather. One of the main things a bike rider can do is to wear reflective tape and also to have lights on the bike. Some of this is not required under the law in Massachusetts, but if a bike rider is not doing anything to be as visible as possible, it might be possible for the defendant to claim the plaintiff was also negligent in connection as serious Boston bike accident. Fortunately, for bike riders in this state, we are not in what is known as a pure contributory negligence jurisdiction. Under a pure comparative negligence jurisdiction, any negligence committed by the plaintiff will be enough to completely bar the plaintiff from recovering in a civil trial for negligence. In Massachusetts, the plaintiff is not barred from recovering as long as the defendant was more negligent than the plaintiff. In this circumstance, the jury will determine what percentage each party was at-fault and subtract the percentage of plaintiff’s negligence from plaintiff’s monetary award. An example would be where plaintiff was not wearing any reflectors or using an lights in poor visibility conditions, but defendant was driving way too fast and would not have been able to stop in time even if the plaintiff was wearing lights and reflectors. One other tip involves the way in which ice and slush can build up on certain parts of the roads. On some roads, the surface will slope in such a way that the slush and ice runs off to the curbside lane but does not remain in a middle bike lane. If you look a at a road surface carefully, you will notice there is often a slope to it. This will cause cars to drive in the bike lane to avoid driving on ice and snow to the fullest extent possible. There is no legal question that a bike rider has right-of-way on a bike lane, but this is not cause to get in some kind of game of chicken with motorists, especially in bad winter weather conditions. The best thing to do is simply allow the cars to pass and then get back in the bike lane. Again, this is not what the law requires but it is what it means to ride a bike safely in harsh Boston weather. Another more obvious safety tip is always a wear a bike helmet. Even though helmets are not required for adult riders, and they will not protect the rider in every crash fully, having a helmet can seriously reduce the chance of suffering a head injury. This can include a traumatic brain injury (TBI), which can be fatal, and have lifelong consequences in the event it is not fatal.